My Life Journal: Back From Bangkok Holiday! Five days tour were rather long to me. I missed my kids so much, that I couldn't wait to go home. Anyway, I like Bangkok but not its disastrous traffic jam. Bangkok is a shopping heaven to me. The Platinum Fashion is a must go shopping complex. All the clothes are so cheap there, between RM10 to RM25 per piece! A piece of trench coat there costs only RM20 !!! Believe it or not! Well, maybe the material is not the superb one, but is acceptable. What do you expect with that low price? The Bangkok airport is big, competent to our KLIA. There are beautiful scene for photo taking. 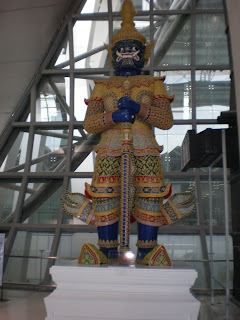 There was something funny on that day I first stepped into Bangkok airport. I was like a silly 'kampung' lady who hasn't been to the city. I didn't know how to on the tap for hand washing after pee in the toilet! I turned, pushed and even hit the water tap to make the water running down! A young girl next to me showed me the sensor at the bottom of the tap.......ar...ar.....show your hand there, and the water will run down!!!! My God! It was so embarrassing! Hubby and friends laughed at me when they heard that. I learnt a lesson here. Take a look at the colourful taxis in that country. They use Toyota Corolla as their cabs. Scenic spots which I had visited to be updated in next post.